My family and I frequently enjoy Way Better Snacks therefore we were very excited to try the new line of Pita-ahh Chips. These “simply sprouted” chips are absolutely delicious and might just be my new favorite snack chip. We even got to try an unfamiliar grain to us, red fife wheat which is packed with flavor and nutrients. Way Better Snacks Pita-ahh Chips is a snack food that I can feel good about feeding to my husband and children. What makes these Pita-ahh Chips so exceptional is that it is made from sprouted grains for easier digestion and maximum nutrient absorption. Made from organic sprouted red fife wheat and whole spelt, the sprouting process can possibly reduce those factors that can make seeds, grains and beans harder for some people like my mom to digest. As an added bonus, I learned that both red fife and spelt have a natural form of gluten that may also be easier to digest as well. Now that you know it is good for you……you are probably wondering, “How does it taste?” Way Better Snacks Pita-ahh Chips tastes extraordinarily delicious….it is unlike any other chip that I have ever eaten. Each chip has a delightful crunch, a subtle honey aroma and a variety of different natural flavors to choose from such as Original, Smoked Havarti (my personal favorite) and Toasted Garlic. These chips are great by the handful or paired with your favorites such as hummus, cheese and olives or dips. Way Better Snacks proves that a company can use simple, wholesome and nutritious ingredients without having to sacrifice flavor and texture. I can also feel confident that Way Better Snacks is Non-GMO verified, certified kosher, low sodium and free of trans-fat, artificial colors, flavors or preservatives. You can feel confident that you will be enjoying the highest quality ingredients which is a great source of whole grains and includes fiber to keep you satisfied for longer. 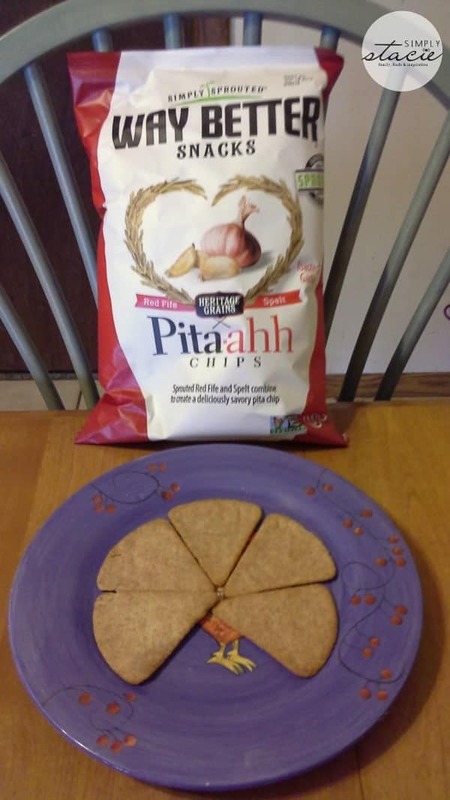 I am very impressed with the new Pita-ahh Chips. Way Better Snacks is my family’s favorite snack brand for afternoon snacks, camping, picnics, parties, tail-gating etc. This new product line is a definite hit too. I plan to stock up and hide a few bags to enjoy myself since my husband and kids will devour it! You are invited to visit Way Better Snacks to learn more about this product and find online ordering information or a store near you that carries Pita-ahh Chips! I would like to try the Havarti Chips I learned that the product is Kosher. All of the flavors sound good, especially the Naked Blues. I think I would like all of the flavors, but no so sure about the Sriracha. I like spicy but not burn your mouth hot. I learned that Sprouted grains are known to be more bioavailable, which means better nutrient absorption and digestibility. All are high in omega 3’s, antioxidants and other vital nutrients, and all are low in sodium and saturated fat. I would like to try the Simply Spicy Sriracha Tortilla Chips. The site shows you exactly what are in their snacks. You can definitely make an informed decision to make better choices when snacking and I enjoy snacking. The Mustard Cheddar Crackers look like a great snack. I would love to try their Sweet Potato chips. I learned that all of the snacks are low in sodium and saturated fat. I want to try the siracha tortilla chips. I love sriracha on EVERYTHING! The sriracha-flavored chips would be awesome! I like the Pinch of Sea Salt Pita-Ahh chips. The sriracha ones sound amazing! i LIKE THE SOUND OF THE TORTILLA CHIPS!